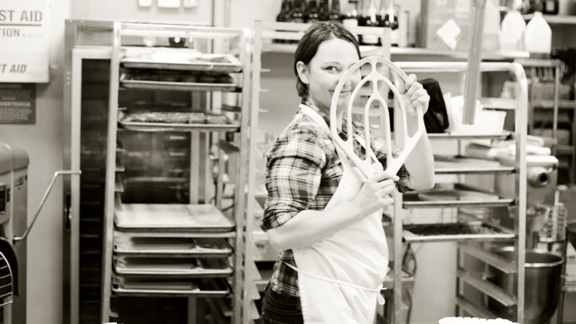 Pastry chef Dana Cree is making the leap from restaurants (and her post at Blackbird in Chicago) to the world of dairy, taking a position as Culinary Director for 1871 Dairy. She is documenting the process in a multi-part series, here on ChefsFeed. Catch up if you're just joining the party, with Parts One, Two, and Three. I was once told this in a moment of personal doubt, when I struggled to see the direction my path was taking me. It wasn’t said to threaten me, but to free me; inevitably, in a restaurant, everyone who works there will leave. Unless, that is, you own the joint, which reduces your chance of leaving by half. Everyone will be the one who leaves at some point, but what of those left behind? What happens to a cook when their chef moves on? I’ve always considered the positions I’ve held custodial. Just as I took the position at Blackbird from another pastry chef, so I have given it to yet another comrade-in-arms. When the goodbyes were said and my last staff meal was eaten, I walked away knowing another pastry chef was there to carry the torch. Luckily, the daily urgency of restaurant work relies on a momentum that helps every cook carry on through the early days of transition. But it isn’t easy watching the department you’re an active part of change and mutate in front of your eyes. Even the most flexible dispositions have breaking points. How do you work for a boss you didn’t choose, particularly if you took the job at a restaurant specifically to work for the dearly departed chef? One thing I would tell all my cooks is that they came to work for Blackbird, just as I did. When you strip back all the nuances I plastered over the walls of that pastry department, the foundation underneath is always going to be Blackbird. It is the roof over our heads, the coats on our backs, the ovens we fill with cookies, and the entity that signs our paychecks. That’s true whether I’m populating the department with dishes, or another pastry chef is. Things will be different. This isn’t good or bad, but temporary. The discomfort of transition isn’t a sign of a storm coming, it’s a sign of a little cloudy weather quietly passing by. You’re going to carry weight you’re not used to as a new leader revises and disperses labor to fit their menu. You’re going to be asked to give up some of the stability you’ve come to rely on. Only if you start to flail in panic, will things start to collapse. The Irish butcher at the Fat Duck once told me to be like the willows in the wind, which bend and sway with the wind from any angle. Eventually, they stand back up straight. As the winds of change pass, remember the flexibility that benefits these reeds. You’ll soon have a new routine to carry you through the day. When a chef takes over a functioning kitchen, there is an inevitable double-power shift. First, cooks will need to train the new chef on the nuances of the restaurant before they can step back into the director’s chair. As cooks, you were taught how to do your job by someone else, and now it’s your turn to give that back. A new chef will come in knowing how to do their job, but they don’t know how to do yours. It’s a power shift that doesn’t feel natural, when a cook feels like they know more than the chef, but teach them with patience. The sooner you do, the balance of the world will fall back into place. The other side of the coin is something every cook working through a change in command needs to hear. You didn’t pick them, but they didn’t pick you either. When a chef takes over a kitchen, they are given a full staff to work with, which may or may not be made up of people they would have hired. In a perfect world, the remaining staff and the new chef will be a perfect match. If you work in such a place, congratulations, and I’m super jealous of the rainbow unicorns and glitter tigers you probably also have. In the real world, you have as much to prove to them as they do to you. Now, if you really believe this new chef isn’t the right fit for you, and you just have to move on, ask yourself this: can you find it in yourself to hold up the department while the new chef finds their bearings? It may not mean much to you, but it will mean a lot to a person trying to find a way to lift the weight of their new management job. If it’s not for you, there’s nothing wrong with making room for the right person to slot themselves in—so make your exit with respect and proper notice, and finish strong. Just as every cook deserves to work for a chef that they can thrive under, every chef deserves a cook that gives them the same chance. At the bare minimum, you owe one another that.